Bestel Bridge of Clay voordelig bij de grootste kinderboekwinkel van Nederland. Levertijd 1 dag. The breathtaking story of five brothers who bring each other up in a world run by their own rules. As the Dunbar boys love and fight and learn to reckon with the adult world, they discover the moving secret behind their father's disappearance. At the center of the Dunbar family is Clay, a boy who will build a bridge--for his family, for his past, for greatness, for his sins, for a miracle. The question is, how far is Clay willing to go? And how much can he overcome? 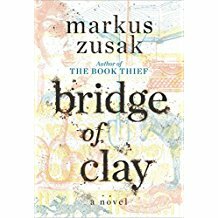 Written in powerfully inventive language and bursting with heart, BRIDGE OF CLAY is signature Zusak.